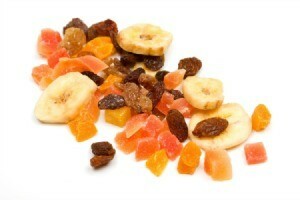 Dried fruit has many cooking uses, from desserts to main dish meals. This page contains recipes using dried fruit. This recipe uses dried fruit to add sweetness and a chewy texture to these moist, golden-brown muffins. Preheat the oven to 400°F. Spray a 12-cup muffin pan with nonstick spray or line with foil or paper liners. Combine the dried fruit, rolled oats, oat bran, flour, banana, brown sugar, baking powder, and cinnamon in a food processor. Pulse until the mixture is just blended, then transfer to a bowl. Combine the milk, orange juice, egg whites, oil, and orange zest in another bowl. Add the milk mixture to the dried fruit mixture; stir just until blended. Spoon the batter into cups, filling each about two-thirds full. Bake until surface of the muffins are golden brown and spring back when lightly pressed, or until a toothpick inserted in a muffin comes out clean, about 15 minutes. Remove from the pan and cool on a rack 10 minutes before serving. Store in an airtight container at room temperature for up to 3 days. I would like to make some apricot syrup using dried apricots. Does anyone have a recipe? I discovered the delight of combining dried apricots and cloves at a breakfast at the Jeddah Conference Palace in Saudi Arabia. The apricots used in this recipe may be prepared a day in advance and stored in the refrigerator. To make syrup, combine sugar with 1/2 cup water, lemon zest, and lemon juice in a medium saucepan over medium heat. Stir to combine and cook until all sugar is dissolved. Once sugar is dissolved, stop stirring the syrup and add apricots, whole cloves, and cinnamon stick. Mix well and simmer 5 minutes, or until apricots become plump. Remove from heat and cool. Remove cinnamon stick and cloves and transfer to a serving bowl. Serve at room temperature or cold. You can strain the leftover apricots and serve them over plain yogurt for breakfast with a dash of cinnamon. Good luck. I make jam from dried apricots. I would soak the cots a few days in a quart of water, well covered in fridge. for few hours, adding more water as needed. I think you would have even better results if you add one can of peaches as well. Check for sweetness and add sugar in 1/2 cup increments. When as soft as going to get, cool, then blend in small batches, then run through sieve. Save what didn't go through sieve for some other purpose in small jar, perhaps as glaze on pork roast or ham with a bit of apple juice or sherry or soy sauce added, or all of that if you like. I have some dried fruit (blueberries and cranberries) that I would like to use in recipes that call for fresh or frozen berries. Would these work if I soaked them in hot water for a short time? If so, for how long? I have done that with raisins and 'craisins' and it works well. I put the fruit in a heatproof bowl and add just enough boiling water to cover the fruit up. Let it sit to plump up for about 15 minutes. It should soak up most of the liquid. Drain the rest of the water if any...unless the recipe calls for water...then you could prob add it in if you want to. I am looking for recipes using dried cherries. Any recipe that calls for Craisins or dried cranberries would work for dried tart cherries. I use an oatmeal cookie recipe and add the dried cherries and some chocolate chips to it - yummy!! Vanilla chips work well also. They are also good in cakes, muffins, anywhere you'd use raisins or nuts. Mel & Maryellen, Thanks a bunch for your help. I use them in a snack for the kids. Buy whole wheat tortilla wraps and cut down into rectangles (shape of the week), in little dixie cups have the following: yogurt, peanut butter, shredded carrots, diced celery, dried cherries, raisins, dried blueberries, dried cranberries. I have the kids make their own snacks. I made my daughter a piece with peanutbutter, dried cranberries, dried cherries, carrot, and she ate it right up.. plus she got needed nutrients!! Enjoy!! I am looking for recipes using dried blueberries or cranberries. I use a basic chocolate chip cookie recipe but add white chocolate chips instead or just chunks of cut up white chocolate. I like ghirardelli's chocolate best. Then I add craisins (I'm sure blueberries would work just fine to.) Here's what really makes them, Throw some chopped macadamia nuts in there. Yum! Sometimes I'll use toasted almonds instead. Depends what I have on hand. (I usually just put about 3/4 cup of each.) Bake according to cookie recipe and enjoy. Everyone always loves them. Also I put them in salad. If you us a balsamic vinaigrette dressing the sweet and sour tastes balance eachother out quite nicely. Actually any baking recipe calling for blueberries or cranberries will work fine. I have put my dried fruit in a small bowl with enough water to cover them for an hour before I start mixing my ingredients. The water hydrates the fruit and makes them chewy in the recipe. Good luck!